It's a little less expensive than I thought to fly from Pittsburgh to Johannesburg, South Africa: starts around $1400, with a couple layovers (in Toronto and Munich), and takes about 24 hours. It's not a trip I'm planning seriously for any time soon (or quite possibly, ever) but if/when I'd ever go, man, someone invite me to a braai, please. Don't know what that is? 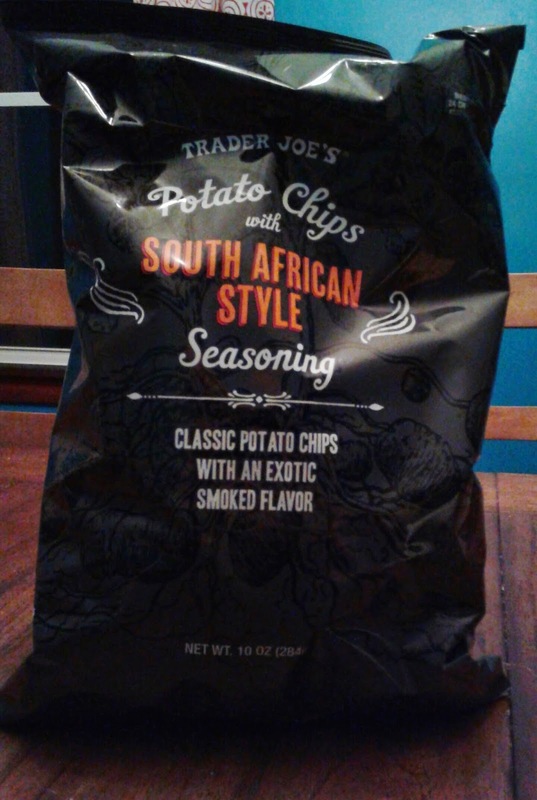 I didn't until I saw it mentioned on the bag of Trader Joe's Potato Chips with South African Style Seasoning and looked it up. Basically, it's a South African style cookout/social gathering centered around lots and lots of meat. There's sosatie and boerewors (two new words for me!) along with chicken, seafood, whatever else...that's my kinda thing right there. Well, apparently these TJ's chips got invited to the party, but to me, the jury's out on whether they really, truly belong or not. There's nothing really wrong with the chips - good, munchy texture, very crispy, almost worth the diet cheat points for that - and, although salty, I like the seasoning mix - lots of different stuff, primarily featuring smoky paprika and garlic - but there's something lost in translation here, I think. In the end, these South African-inspired chippies taste closer to a run-of-the mill straightforward barbeque chip to me, which is kinda boring and not the exotic kick I was looking for. I'm wagering this is not the fault of the spice blend itelf, but because it's on a chip, not a big ol'l chunk of carne. There's no real base for the flavor to blast off from. I've been too busy with some other spices and rubs at TJ's, but I *think* I've seen a South African seasoning blend on the shelf there which, if it's anything like this, would be a terrific pickup to rub on some chicken or fish or sausage or anything that can get all juicy on a grill. Instead, here, we're left with these light little dry crisps without much pop or sizzle. I think a little meaty gristle here could go a long, long ways - there's just not enough here for the seasonings to be able to really, fully express themselves. However, if we were to stay in the chip realm, another chip type may fare better - these are dressed up "Ode to Classic Potato Chip" hombres. A ridged or kettle chip would be a firmer base, with perhaps a little more oomph. I'm not the only one not tooting my vuvuzela about these chips.Sandy's not too much of an ardent enthusiast either. "Ehhh...nothing too special," she stated with a dismissive tune. "I'll eat them but really, they pretty much taste like barbeque chips." Granted, it'd be a pretty darn good BBQ chip, and the price at $2.29 (at least locally) is a perfectly reasonable buy, but we both can't help but be a little bit disappointed here. I've actually been to South Africa. Would definitely expect way more kick and some spices I can't find at the grocery store. Oh no, the one they sell in the spice aisle? I like that seasoning and am almost out. My husband really likes these. He now requests them every time I go to Trader Joe's. He likes that they taste like BBQ chips but aren't sweet like most BBQ chips. I tried them, too and thought the exact same thing: they tasted like a Lay's BBQ chip. Still good but not quite what I was looking for. However, I crumbled some chips and sprinkled them over Trader Joe's Reduced Guilt Mac 'n Cheese. Holy tastebuds, Batman! I agree, bought these chips a few weeks ago and they taste just like the bbq lay's chips. Would have expected something a little more...exotic. they taste like hot dog flavored potato chips with a bit of smoky paprika.